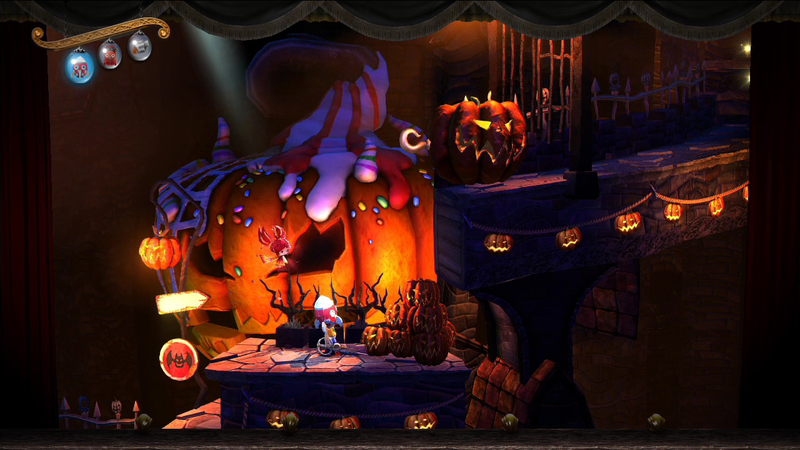 The Puppeteer is a new and exclusive title to the Playstation 3 that brings a particular twist to a familiar 2D platforming genre. 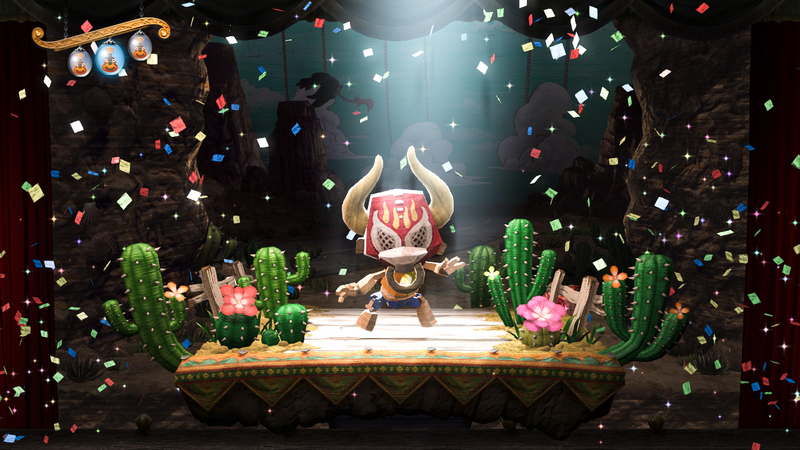 If you had a blast with Little Big Planet, then this game will “string” you over with fun and excitement. You take control of a boy named Kutaro who ends up on the moon as he journeys through and engages in various battles during his adventures. One thing to note though is that he has lost his head on account of the Moon Bear King. Hence, Kutaro will be able to use other heads which grant him different abilities. In addition, a witch has granted him a pair of magic scissors called Calibrus to help with his journey. As a result, Kutaro must recover all the moonstone pieces, revive the Moon Goddess, and defeat the Moon Bear King in order to return to Earth as a normal boy. 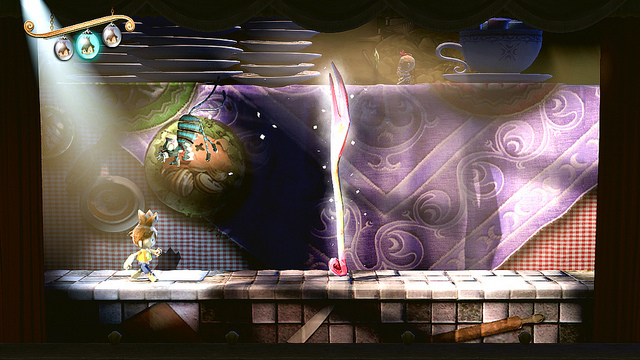 Playing on a 2D platformer like The Puppeteer requires good responsive controls and a familiar button layout. And in this case, the game delivers for the most part. It is very easy to pick up and play without having to spend time to figure out what to press in order to get through the game. Jumping may take some time to get used to since it feels as if your character is floating around a bit. But this won’t take too much out of you during your gameplay experience. In The Puppeteer, there is also the Sun Princess, who is a fairy and the daughter of the Sun God, that joins and helps Kutaro. With the right analogue stick, you’ll be able to float her around the screen to unlock secret passages or even new heads for Kutaro to put on. As mentioned earlier, Kutaro is equipped with a pair of magic scissors called Calibrus which he uses to cut the numerous fabrics that are scattered throughout the levels within this platforming adventure. This is particularly important when it comes time to traveling across in the air. There would be fabric placed one after another in which case you’ll have to cut in a particular way in order to transport you over large chasms. Kutaro will also use Calibrus as a weapon against enemies. The different heads within The Puppeteer is where you’ll find your source of variety and replay value. Kutaro will be able to switch between three heads, each granting him different magic skills that interact with the environment. But if you lose all of them, it will be game over for you. There are plenty of heads that you can come across throughout the game’s levels. When you use their magic in the right time, you get certain kickbacks such as getting help during a boss battle or unlocking a bonus stage. If you are a completionist and need to experience and uncover all secrets contained in The Puppeteer, this is where you’ll be drawn in. Every now and then, you’ll have specific quick time events that will require you to press a certain button. For instance, when you engage in boss battles, you would figure out their movement and attack patterns in order to defeat. Then in the end, a quick time event will kick where the screen will show which button to press. It plays out similarly to God of War and it works really well here as it gives you a little extra diversity and a different perspective. However, those of you who just want the consistent and straight-forward action of a 2D platformer may find yourselves wanting to plow through these events quickly. The Puppeteer is presented as if you were inside a theater. You see the curtains, the theater sets, props, etc. which gives a lot of charm. There is just so much attention to detail to the background as well as the effective design to the characters that will bring awe to the players’ eyes. Additionally, the things that take place in the environments are pretty dynamic. Set pieces will jump in and out of the set, which makes the overall presentation very interesting and uplifting. The audio behind The Puppeteer is also impressive and well executed. You’ll hear the audience’s voices as they laugh or gasp depending on what is happening on screen. So you don’t only get the appearance but also the auditory experience of being inside the theater. For the most part, the music is enjoyable and a hoot to listen to. The tunes set the mood appropriately and adds quite well to the game’s atmosphere. All in all, The Puppeteer has a lot of charm that will bring a smile to your face. 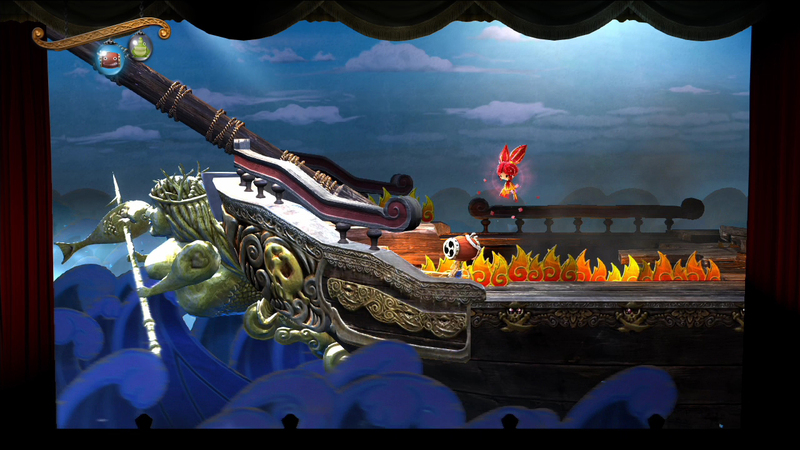 The 2D platforming gameplay will be your source of fun while the presentation will have you glued to the screen. This is definitely one game you don’t want to miss for your PlayStation 3.